AT 5.5M LONG, THE AQUATX EXPEDITION IS DESIGNED TO GO FAST. 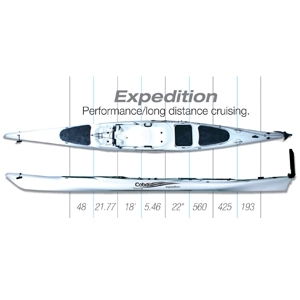 BUILT FOR THE PERFORMANCE PADDLER, THE EXPEDITION ACCELERATES QUICKLY AND GETS TO TOP SPEED IN A SHORT PERIOD OF TIME. This boat has lots of storage and is ideal for any paddler interested in performance touring, sea kayaking and long distance cruising. A high level of paddling efficiency enables Cobra Expedition paddlers to travel longer distances in a shorter time with less physical effort. The long narrow waterline allows the hull to slide easily, quickly and smoothly through the water with minimal effort. The low profile deck is a unique feature for a sit-on-top and greatly cuts down on windage. A V-shaped keel and an adjustable leg length rudder system provide improved tracking and stability. Complete with: x2 A Hatches, Small Rectangular Hatch, Rudder System.